Running around a splash pad on a hot, sticky St. Louis summer day is a joy for little kids. And, let’s face it–it’s a cheap outing for you! 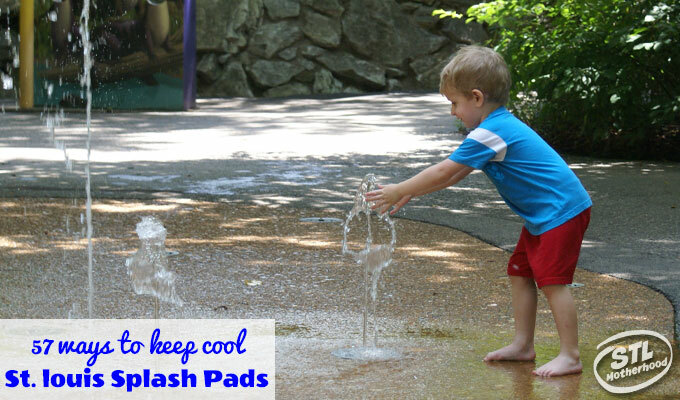 There might be a few good splash pads hidden behind gated areas–I’m looking at you St. Louis Children’s Zoo–most are located in totally free public parks. Mitch and I have our favorites: Creve Coeur Park, Sylvan Springs and the Children’s Garden at the Missouri Botanical Garden are all great places to cool off without diving head first into a swimming pool. And if you happen to be downtown, the spray plaza at CityGarden is a must stop! Pack a picnic, a towel and your kid’s swimsuits–or just bring along an extra change of clothes! In fact, I like to keep a couple extra beach towels in the car just in case our summer time park hops find us at a splash pad we can’t resist running through! Located in public parks, you won’t spend a dime to have soggy summer fun here! 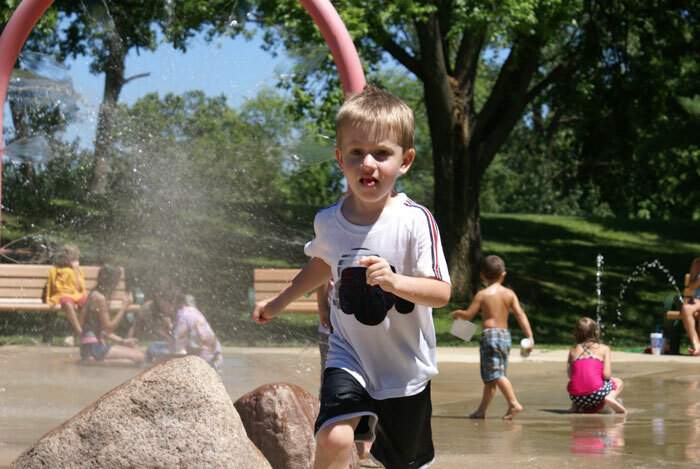 Tilles Park is a popular splash pad with several simple bubbling fountains in a sunny area. 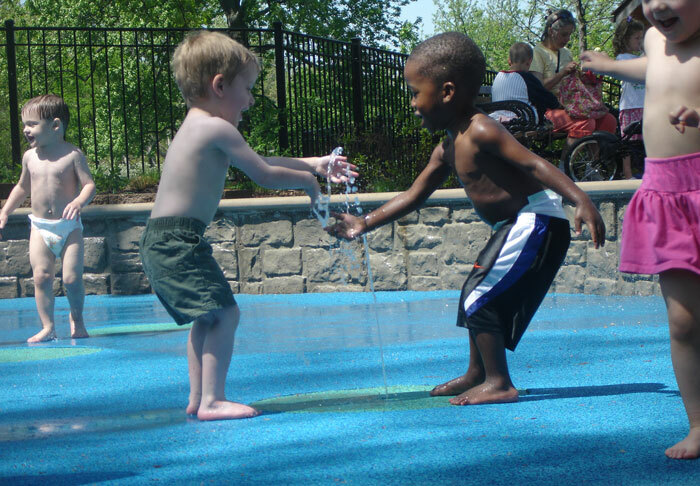 Automatic timers run from 10 a.m.–8 p.m.
Creve Coeur Park has two water play areas, but the one at Branwood Shelter is open seven days a week and features a water-soaked playground and plenty of shade for parents. The fountain at Shelter 1 has fewer features and is only open on weekends. Automatic timers run from 10 a.m.–8 p.m.
Sylvan Springs has 10 different water features to run through—it’s like a watery obstacle course. A dry playground is located nearby, but there’s not a lot of shade. 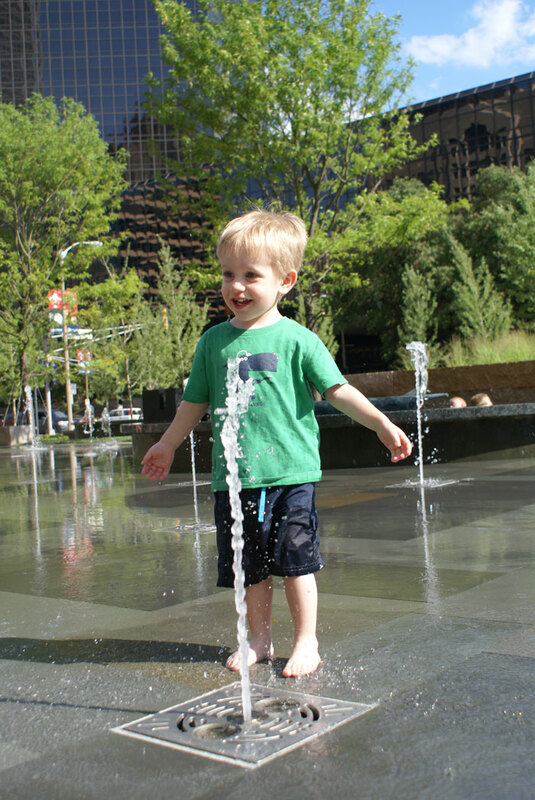 Automatic timers run from 10 a.m.–8 p.m.
CityGarden mixes art and playful fountains where children are welcome to splash. Located in the heart of the city, on Market Street, you can stop by after a trip to the Arch or a ballgame. The water features are open for play from 10 a.m.–8 p.m., when park staff is present. Tower Grove Park has a wading pool with fountains for children and a nearby pavilion that offers plenty of shade. The wading pool is open daily from 10am to 7pm. These splash pads are just as fun, but are located inside places that charge admission. The St. Louis Zoo Children’s Zoo has a simple splash fountain that’s a fun place to cool down (if you remember your kid’s towel). Bubble fountains shoot upward on a random timer, and there are plenty of shady benches for parents. Admission to the Children’s Zoo is $4–but it’s free the first hour the Zoo is open. The Missouri Botanical Garden Children’s Garden has a rubber-surfaced splash pad that switches on whenever temperatures rise above 70 degrees. Admission to the Children’s Garden is $5 for non-members between ages 3 and 12; free for kids under 2 and $3 for members; adults get in free, and no admission is charged for city and county residents on Saturday before noon. My friend Angie of Let’s Go St. Louis made this AWESOME map of all the splash pads in the St. Louis Metro area! There’s 57 splashy parks located as of publication, but she might find some more as time goes on! Click the map to go to the Interactive Google Map and see all the details. The BLUE icons are parks with “proper” splash pads–think fountains, sprinklers, jets. The BLACK icons are parks that have a sprinkler pole–not the best, but hey, you’ll get wet. Click any of the icons on the interactive map and you’ll get details of each park, and a link to Play St. Louis–and in depth website listing every play space in St. Louis. Do you know of a splash pad that’s not on the map? Then join us at the Let’s Go St. Louis Facebook page and let Angie know!